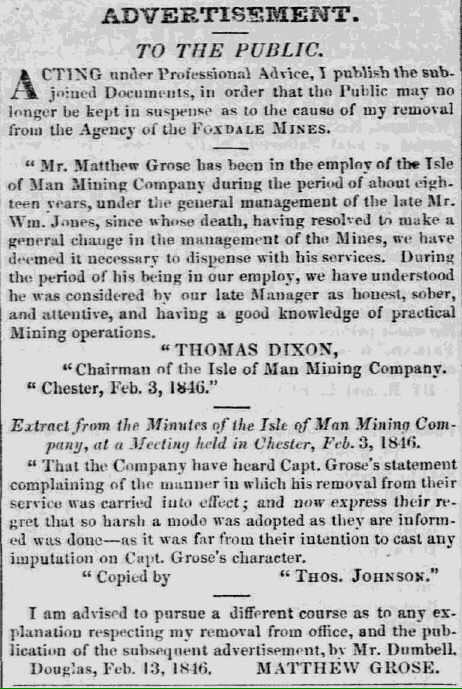 Before we cover the career of Captain Matthew Grose (1819 – 1887), we’re going to look back more closely at his father’s time with The Isle of Man Mining Company. Just to recap – his father was Captain Matthew Grose (1788 – 1849) born in Loxton, Somerset to Cornish parents. He was a first cousin of the ‘most scientific engineer in Cornwall’, Captain Samuel Grose junior (1791 – 1866). 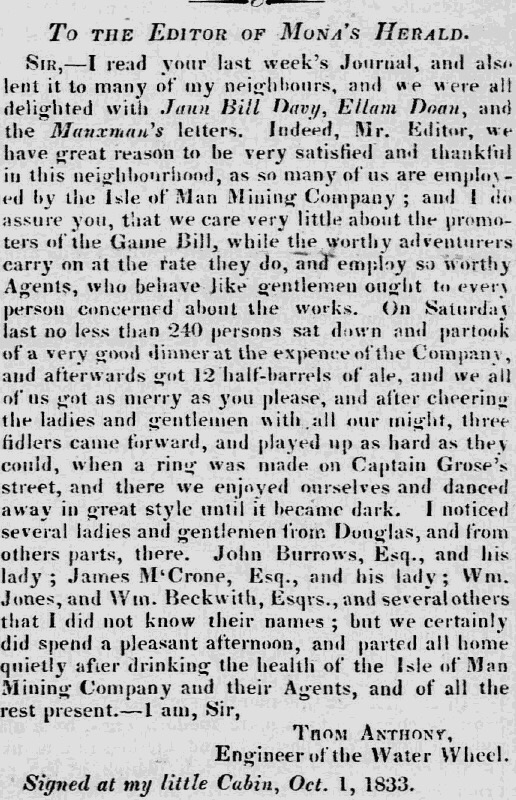 In 1828, The Isle of Man Mining Company is formed by three adventurers from the Chester area. The mines at Foxdale are under the management of Mr. William Jones. Captain Matthew Grose (1788 – 1849) is employed as the Mine Agent there. In 1833, local newspapers indicate that Matthew Grose is a popular Agent and member of the community. By this time he’d worked for the Isle of Man Mining Company for approximately five years. After a company dinner, the engineer of the water wheel, Thom Anthony, expresses his gratitude by writing into the Mona’s Herald newspaper. 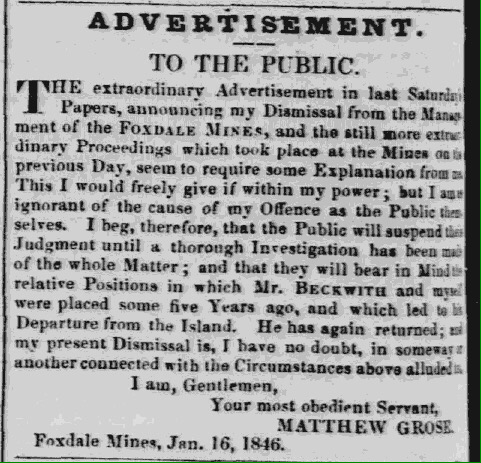 In 1844 Captain Grose advertises for a schoolmaster for the Foxdale Mines School. It is understood the school has been open on the Isle of Man since 1833, or earlier. Mona’s Herald, Tuesday, May 14, 1844; Section: Front page, Page: 1 Courtesy of Manx National Heritage. 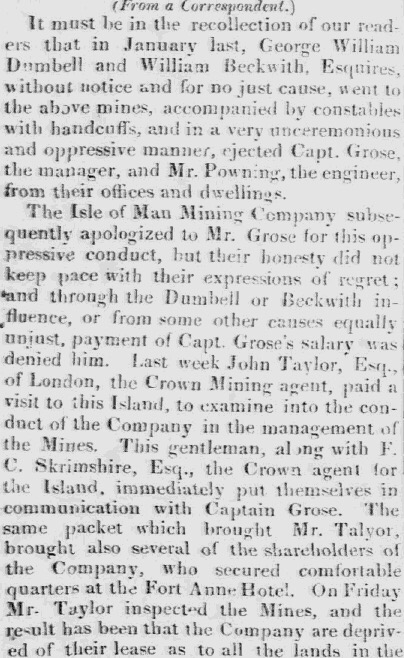 In January 1846, after eighteen years of employment with the Isle of Man Mining company, Captain Matthew Grose is dramatically dismissed from his position. Rumours swirl that he has been ejected from his dwelling in handcuffs and not paid his salary. By July 1846, there is a dramatic conclusion to the saga when the Crown mining agent, John Taylor, intervenes. 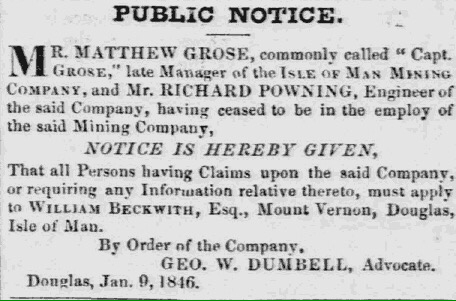 He deprives the Isle of Man Mining company of their lease to land throughout the island, (apart from their mines at Marown) and gives Captain Matthew Grose setts of land taken from the company. The rest of the island (except Lonan) is thrown open to the public. 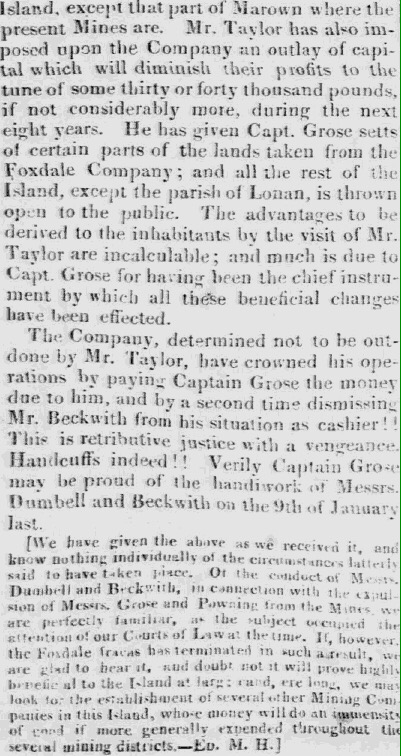 Mona’s Herald, Wednesday, July 15, 1846; Page: 3, Courtesy of Manx National Heritage. In the next post, we’ll see what opportunities and risks were taken by Captain Matthew Grose (and his sons) after these dramatic events! Many thanks to iMuseum Newspapers & Publications for providing digital access to the Isle of Man newspapers (from 1792 to 1960). 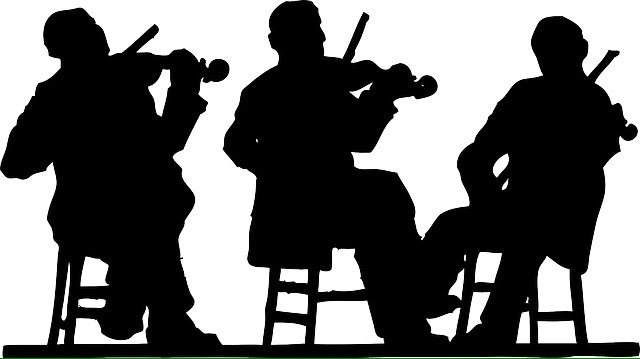 Images and text are shared on this blog in accordance with their policy of using & sharing for ‘non-commercial personal use’. How remarkable that all this is reported in the newspapers and that they still exist! Quite a story. Yes, it is remarkable – sometimes just the way things are reported in old newspaper articles can really bring information to ‘life’! It sure can. I love doing newspaper research for that reason. And old newspapers were the social media of their day, reporting on all the comings and goings and gossip of the day. Life, how uncertain! Death, how sure!